The Standard Horizon AFC-566FG Automated Floor Model Folder includes advanced set-up automation through a user-friendly 10.4” color touch-screen control panel that displays all common fold formats and sheet sizes for easy selection. 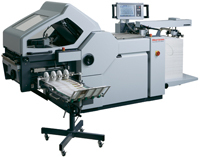 The AFC-566FG brings folder automation to new heights with fully automated setup, including gap settings. This folder has been designed to serve the graphic arts and digital print markets, with ultra-quick changeovers and the ability to handle sensitive digitally-imaged sheets without marking, enabled by specially-formulated combination roller and scoring systems. The AFC-566FG is equipped with 6 fold plates, which allow a wide variety of fold patterns in a minimum amount of floor space, at speeds up to 42,000 sheets per hour.